Made in Maui…these awesome Leather keyring slings can be used solely for your keys or for carrying your Blue Bottle Love bottle….or both! This leather is nice and soft and smooth and feels good to hold and it is also very strong and durable. You can slide the split ring onto the wire bail of the flip top cap, and keep it on there all the time. You can then quickly add your keys on a separate ring, to the mini-carabiner. 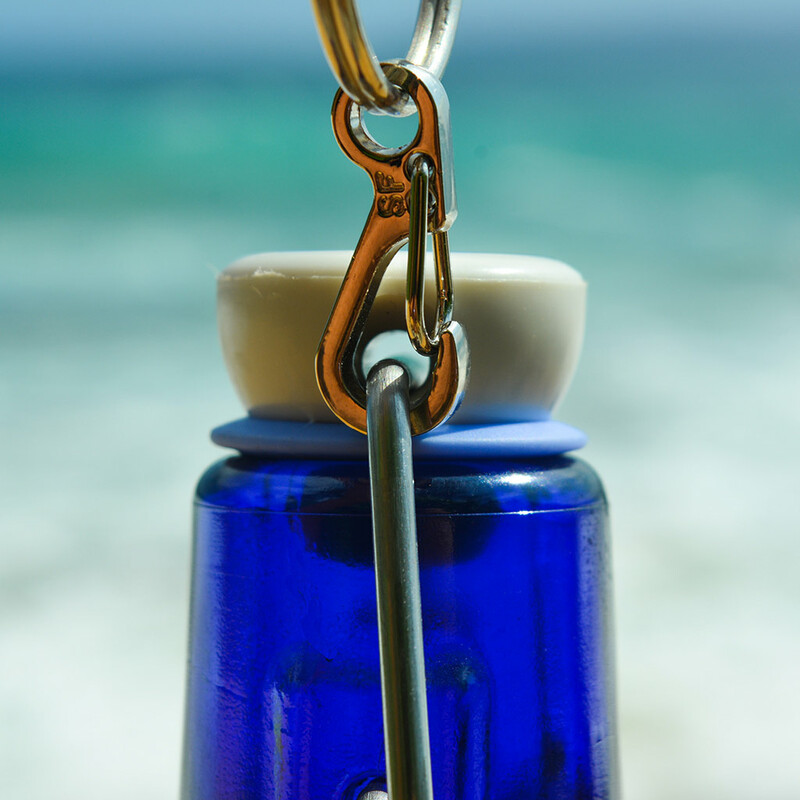 Or you can have your keys always on the keyring, and when you want to carry your water and keys, simply clip the bottle onto the mini-carabiner. It is very strong!! We have added the Leather option because the wonderful person sewing up all of our Hemp and Recycled Climbing Rope Slings also works with Leather. So we thought we would try some out and see what the response is! The stitching matches the label, so for the Black Label, we have Blue Stitching, and for the Blue Label, we have Teal Stitching. Why do we make such simple water bottle carriers that do not cover up the bottle? Well first of all…it is really inspiring to be able to see the beauty and designs of these bottles in action, and especially around sunlight! And yes, sunlight…by keeping the bottle exposed, then there is even more information from the sun being absorbed by the water through the blue glass. Another great reason, is that the bottles are very thick and somewhat difficult to break. Using a simple strap like this will help you carry the bottle easily, but also keeps your attention and awareness on your water and your actions, which is only a good thing! 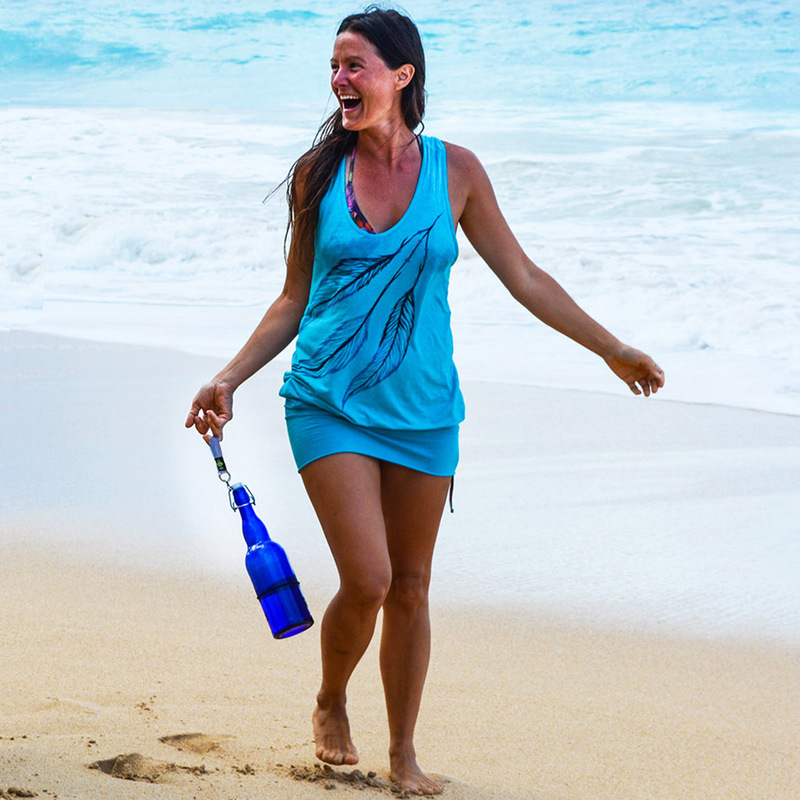 Carrying the bottle on your finger allows you to carry other things without worrying that you will drop the bottle! This is a no-slip method rather than holding onto the bottle.